Following two successful para sport events since 2015, Scottish Disability Sport (SDS) invites you to join them in this year’s exciting National Celebration of Para Water Sport and Para Cycling (Wheels to Water event). Once again, they have partnered with Scottish Rowing, FABB Scotland/ Blazing Saddles Adaptive Cycling, Scottish Canoe Association, Royal Yachting Association Scotland, Clyde Muirshiel Regional Park and Help for Heroes Sports Recovery to offer people with physical and sensory disabilities the chance to try different sports with family and friends. 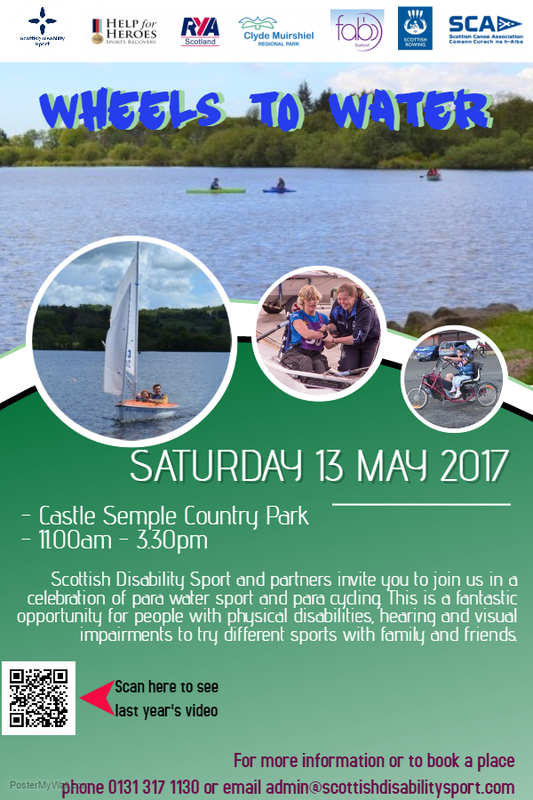 The event is free and is a unique opportunity to try any or all of these sports – cycling (adapted bikes), sailing, rowing, kayaking, power-boating, canoeing and a 5 kilometre handcycling time trial. You don’t need to try all of the sports, let them know which sports you would like to experience and if you would like to continue the sport after the event Scottish Disability Sport will support you to find the right inclusive club. You can also watch last year’s video on their YouTube channel (ScottishDisability) to get an idea of what’s in store. It is essential to book your place as numbers for all activities are limited. The closing date for registration is Friday 5 May 2017. To book a place/s please click complete an online application form. If you would like further information on the event please contact Scottish Disability Sport on email admin@scottishdisabilitysport.com or phone 0131 317 1130.